We’ve been busy tabulating the results of reader surveys (thanks for the all the input!) and are now ready to reveal Touring Plans readers’ picks for the best restaurants at Walt Disney World, 2019. Not surprisingly, some of your favorites are much-heralded signature venues, the posh gourmet spots. But there are also several affordable spots as well, particularly if you enjoy them at breakfast or lunch. 20. Tiffins, Animal Kingdom. Tiffins benefits from the convenient location outside Pandora. When you’ve spent the day riding on the back of a banshee, you’re bound to work up an appetite. The menu features African spices and lots of seafood. 19. 1900 Park Fare, Grand Floridian resort. Buffet service at breakfast and dinner, both featuring Disney characters. The cold strawberry soup is a favorite at either meal. The dinner service includes tableside visits from Cinderella and Prince Charming, as well as Cindy’s step sisters Anastasia and Drizella. The sisters bring the sass and provide plenty of comedic interaction with guests. 18. Tusker House, Animal Kingdom. Donald Duck and friends character dining at breakfast, lunch, and dinner. A balanced mix of American dishes and African specialties. If you have a nervous eater in your party it’s a good first step into exploring the world of African cuisine; they can start with as much or as little as they like and there are plenty of “safe” options if they’re not in an experimental mode. 17. Wine Bar George, Disney Springs. This is a bar with a strong food game. Come for the wine, stay to share the tapas-style small plates with your companions. Perfect for a shopping break or light supper. 16. Liberty Tree Tavern, Magic Kingdom. Thanksgiving dinner, every day of the year. If you’re not in the mood for turkey and the fixins, there are other comfort food options like meatloaf and pot roast. Convenient location right in the middle of Liberty Square. P.S. They now serve beer, wine, and hard cider. 15. Crystal Palace, Magic Kingdom. Breakfast, lunch, and dinner buffets with Winnie the Pooh and his pals. Try to get a breakfast reservation before the park opens and you’ll be fed for the day and in a perfect place to hop on the rides as soon as they open. 14. The Boathouse, Disney Springs. There’s a solid menu of seafood classics like clam chowder, fried shrimp, whole lobster, and a full raw bar, as well as steaks and chicken, but the real star is the vertiginous S’mores Baked Alaska, a mountain of rocky road ice cream and toasted marshmallow fluff. Don’t try to conquer it alone. 13. Spice Road Table, Epcot. The outdoor seating offers some of the best views for people watching at Epcot. You can get small plates or full entrees of Moroccan and Mediterranean dishes. Share a pitcher of their signature sangria and some hummus fries (really!) and you’re in for a pleasant afternoon. 12. Rose & Crown, Epcot. Pretend you’re in Merry Olde England when you’re munching on fish ‘n’ chips, shepherd’s pie, or bangers and mash. They’ve got a nice whiskey sampler and a large selection of “pub blend” mash-ups of British beers and ciders. 11. Grand Floridian Cafe, Grand Floridian resort. The food is basic American fare, but it’s a relaxing setting away from the mayhem in the parks. If you’re looking for a classic eggs Benedict breakfast, this is a lovely place to find it. 10. Teppan Edo, Epcot. Japanese hibachi. They do a good classic onion volcano and often prepare it with a hidden Mickey twist. Great fun for kids who haven’t seen a pro hibachi chef at work. 9. Beaches & Cream, Beach Club resort. Diner-style food like burgers, grilled cheese, and turkey clubs. But you can skip that and move right into dessert. This place is famous for its Kitchen Sink Sundae, an eight scoop monstrosity mounded with fruit, sauces, brownies, whole candy bars, and more, topped with an entire can of whipped cream. 8. Chef Art Smith’s Homecomin’, Disney Springs. THE BEST FRIED CHICKEN YOU WILL EVER EAT. Also moonshine samplers, outstanding service, and a Southern treat – pineapple-banana hummingbird cake. 7. Yak & Yeti, Animal Kingdom. Asian-inspired dishes like pork belly ramen and wok-fried beef. Take a walk around the restaurant to see all the Asian art and decor. 6. Boma – Flavors of Africa, Animal Kingdom Lodge resort. Buffet-style service at breakfast and lunch with a good mix of African and American dishes. 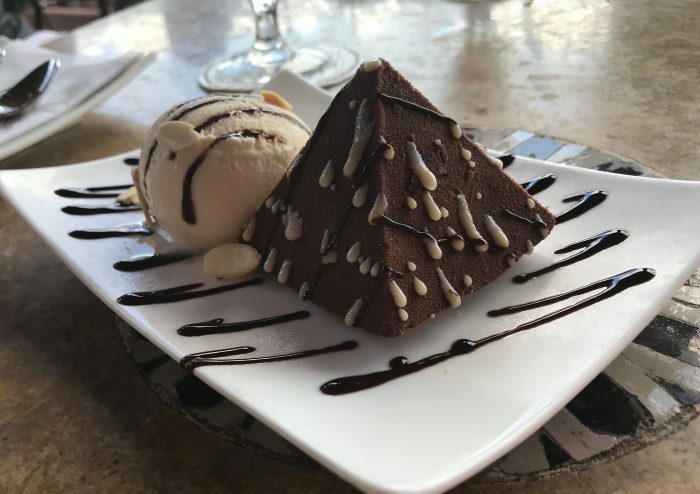 Their dessert specialty is Zebra Domes, a cake base topped with mousse and enrobed in white chocolate and then drizzled with chocolate stripes. 5. Garden Grill, Epcot. Garden Grill is the highest ranked character meal in our survey, with good reason. The atmosphere is unique; you’re dining on a revolving platform that circles past scenes in the Living with the Land attraction located just below the restaurant. The food is fresh and flavorful, with some ingredients grown right there in the Land pavilion. Because of the circular configuration of the dining area, the tables are spread across a narrow band rather than in a cavernous space like some of the other character dining venues. This makes it one of the calmer, quieter places to dine with characters, a sanity-saving feature for many a tired parent. And for the kiddos, Mickey, Pluto, and Chip & Dale greet here. Chip & Dale are among the most lighthearted of the guest-interfacing characters. They’re big on whimsy and often quite playful with young kids. 4. Sanaa, Animal Kingdom Lodge resort. Sanaa is the most affordable of the sit-down restaurants at the Animal Kingdom Lodge. Tucked away at Kidani Village, you can take your time noshing on favorites like an Indian-inspired bread service or lamb kefta. The menu is tilted toward dishes flavored with African and Indian spices, but you can also get a New York Strip steak if you’re in the mood for an American classic. Try to get a seat by the window for a few of the zebras while you dine. And bear in mind that the view is best while it’s light out, so during the winter months you may want to target Sanaa for lunch rather than dinner. 3. California Grill, Contemporary resort. The restaurant specializes in fish dishes (sushi, king salmon, yellowfin tuna) and boasts an extensive selection of California wines, but the real draw here is the fireworks. Dinner guests have a bird’s eye view of the evening entertainment at the Magic Kingdom; they even dim the restaurant lights and pipe in the soundtrack during the fireworks presentation. In addition to dinner, California grill offers a popular Sunday brunch. 2. Jiko – the Cooking Place, Animal Kingdom Lodge resort. Yet another standout at Animal Kingdom Lodge. (Seriously, if you’re a foodie and you don’t want to leave your hotel, Animal Kingdom Lodge should be at the top of your list of places to stay.) This is the gourmet version of African-influenced flavors: cocoa-crusted bison, Botswana Seswaa-style beef short ribs, and lamb tagine are all featured on the menu. Also look for their list of South African wines. 1. Victoria & Albert’s, Grand Floridian resort. There’s not much to say about Victoria & Albert’s that hasn’t been said before. It has been a AAA Five Diamond Award recipient for decades. The service is both elegant and discreet. You’re serenaded with live harp music while you dine. This is the premiere place to celebrate a milestone birthday or anniversary. I typically hesitate to tell people whether a particular experience is worth it, but not this time. V & A’s will set you back $250-300 per person (including tax, tip, and wine), and it is indeed worth every penny. 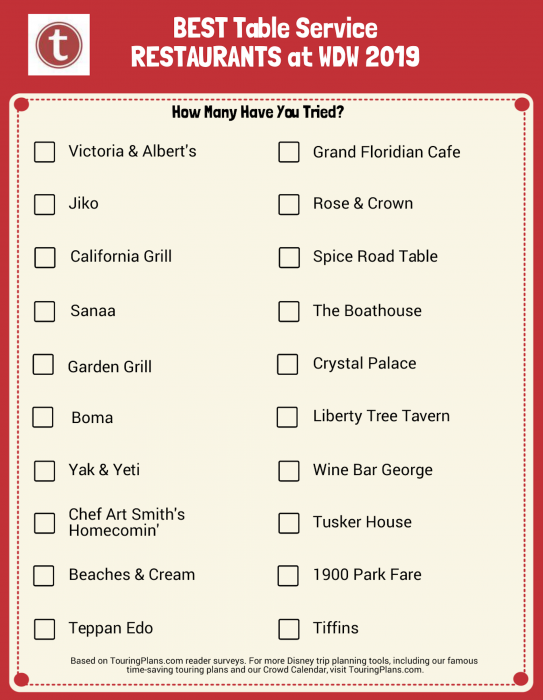 Just in case your bucket list needs filling and you want to try all of these top picks, to help you keep track of your dining adventures, here’s a Printable Checklist of our 2019 Best WDW Restaurants. Is your favorite on this year’s list? Do you have a must-eat dish at one of these restaurants? Are any of these on your list of places to try during your next Disney visit? Let us know in the comments below. Next trip we’re trying Chef Art Smith’s Homecomin’ for the first time–and we’ve got a couple of fried chicken connoisseurs in the family–can’t wait! And return visits to Tusker House, Liberty Tree Tavern, Rose & Crown, and Boma. I think Boma is our new favorite and must-do after our first visit there last year–some of the best food (and soups) we’ve ever had. 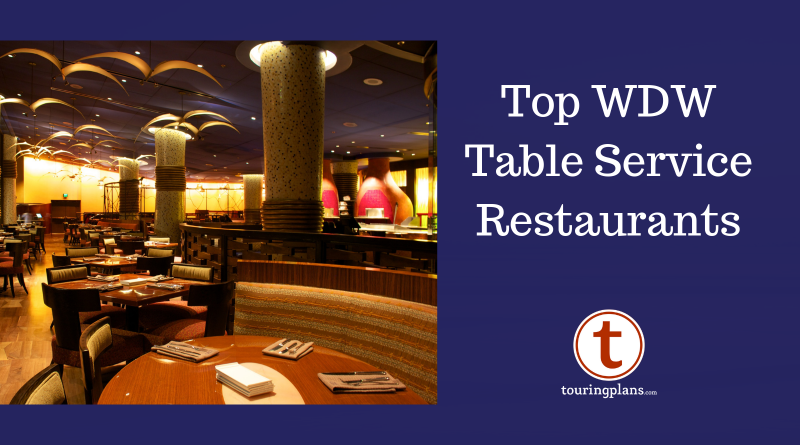 Many of the wonderful, in my opinion, Table Service Restaurants are not even listed such as ‘Ohana, Artist Point, Narcoossees, and Citricos. Beaches and Cream, Crystal Palace, Rose and Crown, and Liberty Tree Tavern may be good, but really don’t deserve to be in the top 20.